Robert Boyer and J Strother Moore established it in 1977. The B-M String search algorithm is a particularly efficient algorithm and has served as a standard benchmark for string search algorithm ever since. The B-M algorithm takes a 'backward' approach: the pattern string (P) is aligned with the start of the text string (T), and then compares the characters of a pattern from right to left, beginning with rightmost character. If a character is compared that is not within the pattern, no match can be found by analyzing any further aspects at this position so the pattern can be changed entirely past the mismatching character. For deciding the possible shifts, B-M algorithm uses two preprocessing strategies simultaneously. Whenever a mismatch occurs, the algorithm calculates a variation using both approaches and selects the more significant shift thus, if make use of the most effective strategy for each case. On the other hand, it might be that a bad character is present in the pattern, in this case, align the nature of the pattern with a bad character in the text. Thus in any case shift may be higher than one. 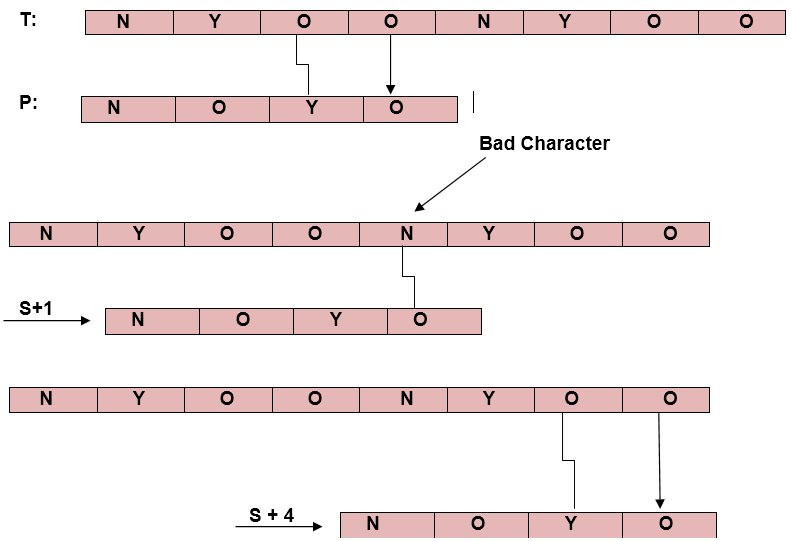 Example2: If a bad character doesn't exist the pattern then. In some cases, Bad-Character Heuristics produces some negative shifts. This means that we need some extra information to produce a shift on encountering a bad character. This information is about the last position of every aspect in the pattern and also the set of characters used in a pattern (often called the alphabet ∑of a pattern). A good suffix is a suffix that has matched successfully. After a mismatch which has a negative shift in bad character heuristics, look if a substring of pattern matched till bad character has a good suffix in it, if it is so then we have an onward jump equal to the length of suffix found.